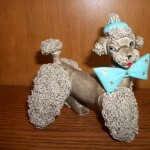 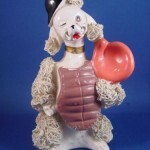 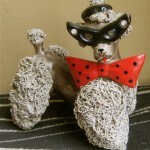 Spaghetti Poodles were made from clay, porcelain, and ceramic; their “hair” was applied in various ways to form various textures to mimic an actual poodle’s hairdo. 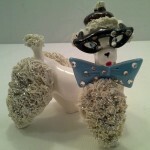 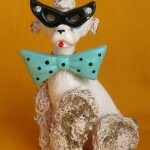 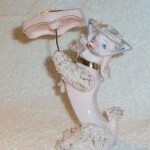 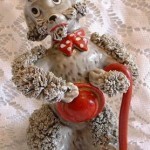 To accomplish the spaghetti look, decorators and designers would have different techniques like using tea strainers to push the material through it to form strands that were then affixed to the poodle giving it a pom-pom look or swirled onto to the poodle for a curly look. 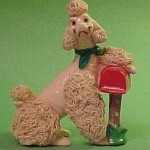 Spaghetti is very fragile and tends to break or chip during the years. 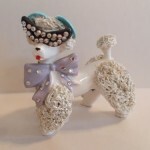 Many poodles also have sparkly rhinestones for their eyes and embellishments on their hats and also applied to their collars. 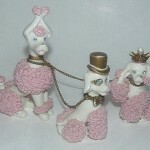 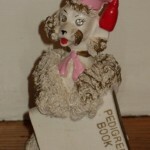 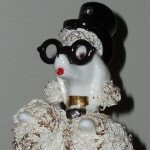 Pearls and ceramic flowers were also added to many poodles for decorations on their heads, hats and various parts of body to mimic pom-poms. 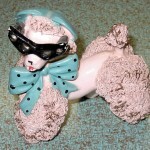 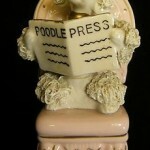 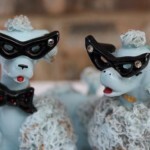 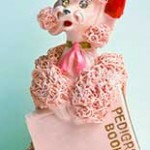 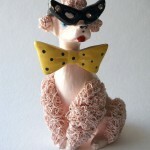 Poodles are highly sought after and collectible today. 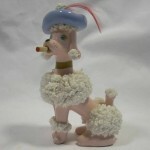 Seems everywhere one looks we are returning to the nostalgia of yesteryear in some ways. 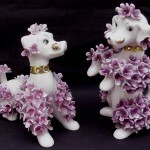 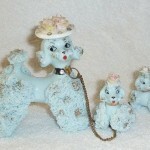 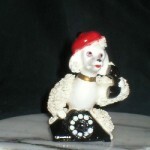 Prices for poodles 4” inches – 5” inches tall is around $25.00 – $50.00 and go up from their depending on the rarity and maker of the item along with size and condition. 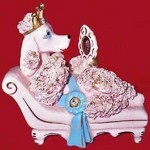 Expect to pay more for decorated poodles with rhinestones and embellishments as well as the larger the poodle size is the higher the price will be. 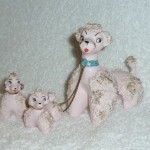 When you are out searching for your poodle collectibles be sure to give the item(s) a thorough once-over by making sure rhinestones are all intact, spaghetti is intact, paint is not too worn, chained groups are still chained together with their original chains and items that have parasols still retain their parasols.